If you’re looking for a delicious sweet treat, nothing beats the fresh-fruit flavor of a good smoothie. Smoothies have just the right mix of flavor and healthy ingredients…so you don’t have to feel so guilty about indulging in them! 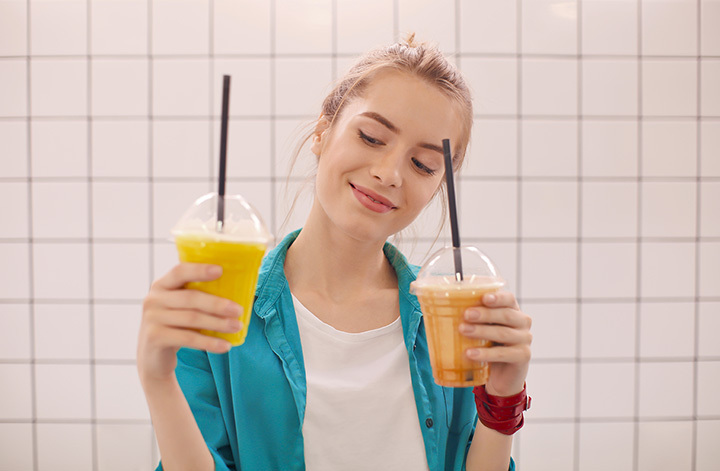 With flavors like “trop-kale,” wild berry, and mango, you can grab a refreshing drink at one of these awesome local smoothie spots in Arizona! Kaleidoscope isn’t just any other smoothie spot. This healthy juice bar and eatery specializes in raw, organic ingredients for your body. They’re known for serving up cold-pressed juice, tasty health food, and delicious acai bowls. It’s also a go-to spot for customers looking to detox. You can start your next juice cleanse at any of their four Valley locations. Kaleidoscope also has a number of “superfood” shakes and smoothies available. These sippable meal substitutes come with protein, fruit, almond milk, and additional flavors. Fast service, fresh ingredients, and delicious smoothies. That’s what you’ll find at Xoom Juice in Tucson. This long-standing smoothie spot has a huge selection of healthy ingredients available to craft their many beverages. You’ll find ingredients like soy milk and pure fruit juice over corn syrup, sugar or artificial flavors. You can also choose from dozens of flavors and add healthy “xoomers” like whey protein, antioxidants, and multi-vitamins for your smoothie. Fast food doesn’t have to be unhealthy. Case in point: Grabbagreen. Grabbagreen is a healthy fast food restaurant that uses semi-organic and GMO-free ingredients. In five short years, they’ve grown to encompass five Valley locations thanks to their acai bowls, salads, fresh-pressed juice, and smoothies. You can grab one of a dozen delicious flavors of smoothie at any of their locations. Their health-oriented smoothie options include the Oxidation Elimination, Immunization Station, and Vita Vamp. Find locations in Gilbert, Phoenix, and Scottsdale. Meet your new healthy addiction at the Berry Beet Juice Bar. This family owned and operated juice bar has taken Ahwatukee by storm thanks to their healthy, made to order beverages. The Berry Beet uses organic, vegan-friendly ingredients to make their 18 smoothie flavors. You can choose between GMO-free standard smoothies or treat yourself to a specialty smoothie made with non-dairy frozen coconut cream or organic frozen yogurt. It’s healthy on the go at D’Lite. D’Lite is a healthy fast food restaurant with four locations Valleywide (Phoenix, Tempe, and Scottsdale). Led by a husband and wife duo, this local health-food spot uses organic, all natural, and locally grown ingredients. The result is a delicious mix of sandwiches, salads, soups, and beverages. They have five flavors of tasty smoothies available, including a seasonal variety and the famous “house” smoothie. Need an extra kick? You can add protein to your smoothies for a small fee. Are you a fan of acai bowls? You won’t want to miss a trip to Berry Divine. This healthy restaurant specializes in making a range of these semi-frozen delicacies served with a mix of fruits, granola, and healthy super foods. Berry Divine has locations scattered across the state in Sedona, Tempe, and Tucson. They put an acai bowl spin on their tasty smoothies. Each one is made with an acai puree base, fruit, and more healthy ingredients. Welcome to paradise. Paradise Juice is a Phoenix-based healthy eatery that has been serving up delicious smoothies since 1999. That longevity can be attributed to their health-based menu featuring things like vegetable juices, sandwiches, salads and acai bowls. Really, though, Paradise Juice is all about the smoothies. They have a mix of super food, protein, berry, and green-based smoothies that are equal parts healthy and delicious. Drink up! Juice Core is primarily a spot for organic and cold-pressed juices. But you don’t have to be on a juice cleanse to enjoy their healthy beverages. You can opt for one of their seven flavors of smoothies instead. They have a mix of inventive smoothies with titles like tropi-kale, green thumb, and mint chip. Want to know the best part? Juice Core delivers within a 15-mile radius of their Scottsdale shop. Smoothie Run keeps it simple. You won’t find any fancy flavors or dynamic ingredients at this no-frills establishment. You will find delicious smoothies made with fresh fruit, vegan and gluten free ingredients, and your choice of juice. Smoothie Run has 20 flavors of fresh smoothies to choose from. This healthy spot also serves up a mix of fresh salads, sandwiches, and pitas. Make Monday better! Grab a regular smoothie to get started, and get it free with a gift card purchase of $10 or more! Don’t sleep on Dutch Bros. Most people know Dutch Bros. Coffee as a popular drive-thru coffee chain (with locations in Tempe, Scottsdale, Phoenix, Mesa, and Gilbert). What most people don’t realize, however, is that they have serve some seriously tasty smoothies. Their menu includes items like blueberry pomegranate, caramel apple, and wildberry smoothies. Each of their decadent smoothies is topped with a thick layer of whipped cream.